Lawrence Livermore National Laboratory, one of the country’s top scientific research facilities, announced the new mega machine yesterday. The supercomputer uses a platform called TrueNorth, a brain-inspired group of chips, which mimics a network 16 million neurons with 4 billion synapses worth of processing power. In other words, it’s capable of recognizing patterns and solving problems much like a human does. Cognitive computing itself isn’t new. For years, companies like IBM have been trying to develop AI that mimics human decision making: That is to say, machines that learn from their mistakes like humans and can adapt quickly to changing, complex situations. But what makes this new platform nuts is how little energy is required: a mere 2.5 watts. That’s less than even a really dinky LED lightbulb. 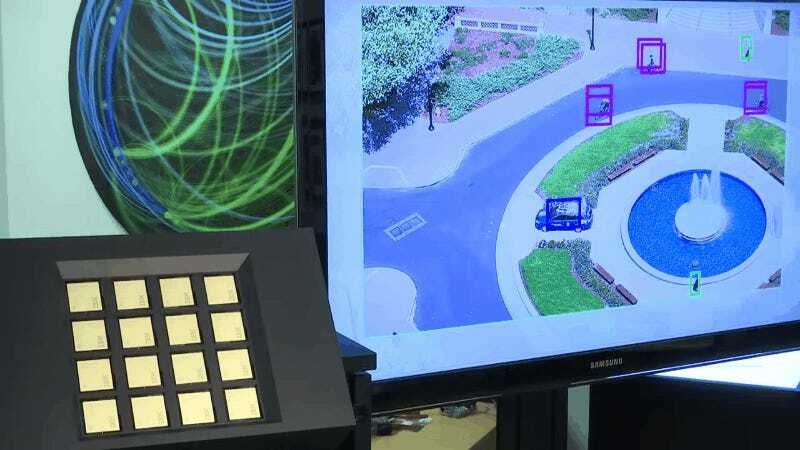 The array of TrueNorth chips, which set the lab back a relatively cheap-sounding $1 million, will be used in government cybersecurity missions. It will also help “ensure the safety, security and reliability of the nation’s nuclear deterrent without underground testing,” according to the press release. SF Gate points out that in five years or so, the TrueNorth chips could even help smartphones achieve facial recognition, or smart glasses help blind people navigate their surroundings. But for now, it’ll take six months to install the chips in the computers in Livermore. Just relax and leave all national security measures in the hands of the blinking, glowing machines.